Your water heater is a quiet workhorse in your home, working hard every day to heat the water you use in all your appliances and taps. Working that hard does come at a cost, however: on average, heating water accounts for about 20 percent of your monthly energy bill. The good news is you can chip away at that number with some simple adjustments. Here are five ways to get the most bang for your water heating buck. Adjust the default thermostat setting. The EPA recommends a temperature setting of 120° to get the best balance between hot water comfort and efficiency – considerably lower than the 140 degree default setting of many water heaters. Look for instructions about how to lower the thermostat in your owner’s manual; if you can’t find that information, call us – we’ll help you figure it out. By replacing old showerheads and aerators with low-flow versions – These devices are inexpensive and can cut water usage in half with little apparent difference in water pressure. By adopting simple conservation behaviors – Developing simple behaviors like using the right load setting for your clothes washer, fixing leaks quickly, efficiently packing your dishwasher, and taking shorter showers can go a long way toward lowering your water heating bill. Insulate hot water pipes. A lot of heat is lost in water’s journey from the storage tank to your taps – especially in the first six to ten feet of pipe leaving the water heater. At minimum, insulate this section of pipe. Get a jacket for your water storage tank. 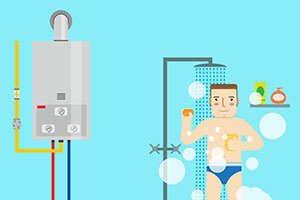 If you own a conventional water heater (one with a storage tank), you’re spending energy every month re-heating water that you’ve already paid to heat once. That’s because water loses heat every minute it sits in that tank in your cold basement (in industry jargon that’s called standing loss). An insulating jacket slows that cooling so you won’t have to reheat the water as often (of course, a propane tankless water heater eliminates that problem altogether…more on that in a future blog). Maintain your water heater regularly. An ounce of prevention for your water heater will keep it running at peak efficiency and help you to avoid emergency service (and an unexpected flood in your basement) down the road. Hocon’s Annual Comprehensive Inspection and Tune-up – one of several Home Comfort Memberships we offer – will keep your water heater running at its best for years to come. Make sensible upgrades. The average conventional water heater will last about 10 years; if yours is nearing that age, you can bet it’s not running as efficiently as a new model – especially if you’re considering making the switch to a propane tankless water heater. In some cases, replacing your current model with a high efficiency version can cut your energy bill by 40 percent or more – enough to offset the cost of your upgrade in just a year or two. For expert propane water heater service and installations, no one beats the pros at Hocon. Contact us today to schedule service – or to get for a FREE, no obligation estimate on a new water heater for your Connecticut home!